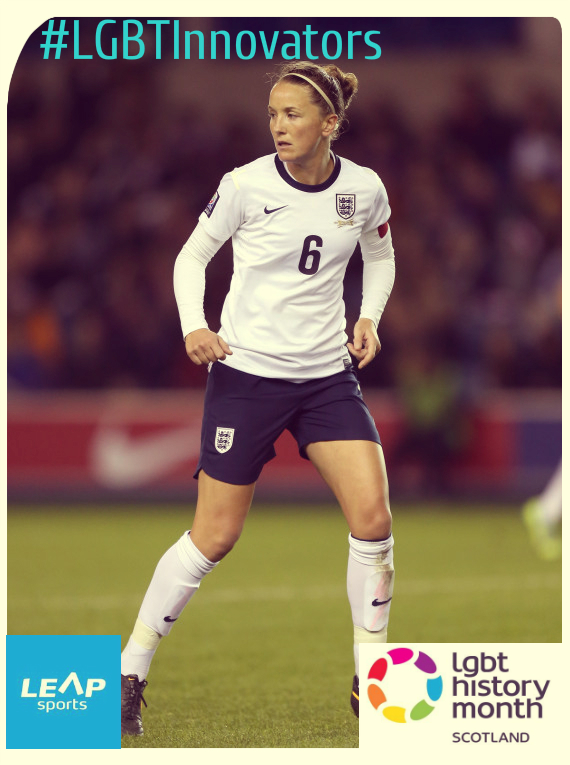 #LGBTInnovators - Footballer Casey Stoney | LEAP Sports Scotland WSL club Arsenal Ladies. "> WSL club Arsenal Ladies. A versatile defender, she has been capped more than 100 times for the England women’s national football team since making her debut in 2000. After being a non playing squad member at UEFA Women’s Euro 2005, she was an integral part of the England teams which reached the UEFA Women’s Euro 2009 final and the quarter finals of the FIFA Women’s World Cup in2007 and 2011. In 2012 Stoney succeeded Faye White as the England captain and also became captain of the newly formed Team GB squad for the 2012 London Olympics. Stoney was previously named 50th on The Independent newspaper’s Pink List of influential lesbian and gay people in the UK. In May 2015 the University of Essex announced that it would be awarding Stoney an honorary degree. Stoneys partner Megan Harris gave birth to their twins Teddy and Tilly in November 2014. Written on 19th February 2016.